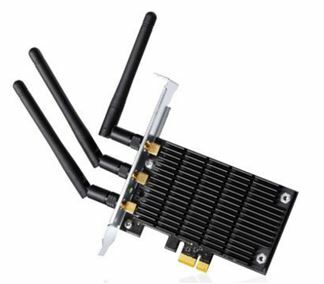 The TP-LINK Archer T8E dual band PCI wireless adapter comes with the next generation Wi-Fi standard – 802.11ac, 3 times faster than wireless N speeds. Its 3T3R MIMO technology provides robust high-bandwidth wireless transmission. With 1300Mbps wireless speeds over the crystal clear 5GHz band or 450Mbps over the 2.4GHz band, the Archer T8E is the superior choice for seamless HD streaming, online gaming and other bandwidth-intensive tasks. It gives users the ability to access crystal clear 5GHz connections or legacy 2.4GHz connections to upgrade their PC’s wireless capabilities to operate with new 5GHz band wireless networks, while ensuring that they can still access legacy 2.4GHz band wireless networks. Click here to find out more about this PCI wireless adapter! This thing rocks. I bought my at Fry's Electronics, had a delivery issue with my Amazon purchase, but they made it right. I was a bit skeptical at first but my mind has been changed. The install was simple. IT COMES WITH A HALF_SIZE Bracket. The disk included has just the drivers, or a Install wizard if you prefer. The utility to see speeds and other WiFi info doesn't work on WIN 10 technical preview. I have added a photo of the connectivity. 5 bars on other side of house at 1.0 Gbps... sweet. Give it a try. AMAZING!!! I was using a Wireless N adapter with a Wireless AC Asus Router. I knew I wasn't getting the best speed that I can from my router. I figured why not get the best you can out of your internet? I decided to give this a try in hoping I get a more solid and consistent speed from my internet because I keep getting disconnected with my Wireless N adapter. On my wireless N adapter I was averaging 50mbps Down/ 11mbps Up speed. With the same exact layout and Router, I popped in this AC adapter, fired up speedtest.net and was instantly happy and affirmed of my purchase. My speed with this adapter was averaging 120mbps Down/12mbps Up!!! The up speed didn't change much but my overall speed shot up more than double and it holds a longer connection. I believe it's been about two months and I've only had like one disconnect. Multi-tasking, gaming, music, browsing, movie, and streaming ALL at the same time? Easy. I was able to see 526.5 Mbps max speeds with my Asus RT-AC68U router on a PC that is about 40 feet away through several walls. The signal strength was good, but not as great as the TP-Link N900 dual band PCIe card. That said, the T8E still has issues with audio stutter when watching Flash streamed videos. The stutter doesn't occur from the start like the N900 card, but after watching for about 10-15 minutes, the audio stutter kicks in big time. Doing research, it appears to be a driver issue and excessive CPU consumption. I have tried updating the other drivers in my PC without any success. Going back to my single band Dell WiFi 1500 card, the audio stutter issue goes away. I've been using a TP-Link AC600 USB network adapter and it also has the audio stutter issue. So far, I've had audio stuttering with 3 different TP-Link dual-band WiFi adapters. Meanwhile, the old N-draft Dual-Band Intel WiFi Link 5100 from my 2008 Dell Studio Laptop works fine as does the single-band adapters on my other computers. Overall: 3/5 stars, Great signal strength and performance, except when watching Flash streaming videos. The audio stutter shows up after watching for about 10-15 minutes. The price is fairly high, if the TP-Link N900 worked better without any audio stuttering, I would go with the N900 dual-band since it is half the price and gives me enough performance. The 802.11ac cards seem way overpriced for what they achieve. This card seemed like a nice companion to my TP-LINK Archer C7 Router. They share the same wireless generation, and similar theoretical speeds. While I could not get the whole 1.3 Gbit in practice, it is better than existing -n technology. For windows, I had to install the latest drivers from the manufacturer site, since Windows Update did not recognize the card (the included CD would have worked as well). However I could not find any working drivers for Linux. The internal chipset is different than the router, and the closed "hybrid-wl" driver did not work properly. So if you plan to use this for a Linux based server, HTPC, or NAS, it would not work -- at least for now. Also, while the card itself is not too tall, it does not come with a "low profile bracket". That would be helpful for assembling a smaller form factor PC. Otherwise, if you plan to use this in a Windows environment with a full size case, the card would work very well. In that case, I would highly recommend it. I bought this to stream games from Steam onto a Linux PC connected to a TV in my living room. So far it works really well. It's much faster than the old first generation wireless card I had in there. Return to top of "TP-LINK Archer T8E AC1750 Dual Band PCI Wireless Adapter"! !